At the forefront of innovative bamboo basket design is Kenichi Nagakura. Trained in traditional weaving techniques, Nagakura continues to explore the limits of bamboo baskets with his innovative style and techniques. 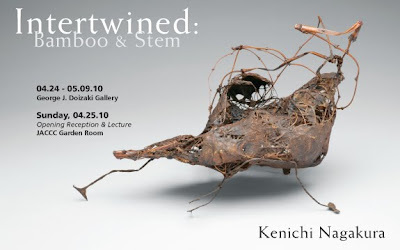 Complimenting Intertwined: Bamboo & Stem Exhibition, acclaimed artist Kenichi Nagakura will give a lecture and demonstrate how thin slivers of bamboo can be blended together to make some of the most creative sculptures today, giving audience members a deeper understanding of bamboo art and the collaborative process between the artists. Bamboo Forest, An Insight by Kenichi Nagakura is part of the JACCC's On the Veranda Cultural Programs. Intertwined: Bamboo & Stem exhibit is made possible in part by the generous support from the TAI Gallery, Santa Fe, New Mexico.